The most popular and enduring of all the gods, Thoth has been responsible for keeping Egyptian magic in the forefront of learning since the collapse of the empire. Although in the later Dynastic period he was merely labelled the 'scribe of the gods'. Some stories place him as a son of Ra, others say that Thoth created himself through the power of language. He is the creator of magic, the inventor of writing, teacher of man, the messenger of the gods (and thus identified by the Greeks with Hermes) and the divine record-keeper and mediator. I have just been reading The Wisdom of Ancient Egypt by Joseph Kaster (originally published in 1968), anyway the chapter I was making some notes on concerned the Pyramid Texts and the story of Osiris (I should add that it was a compilation of spells or groups of spells rearranged to tell the story). There was a section that dealt with the assigning of Osiris in his place in the genealogy of the Gods, and Thoth was listed as one of the brothers of Osiris. 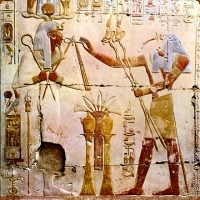 In a footnote it said that it was one of the few references to Thoth as a brother of Osiris and an accomplice of Set. Behold what Set and Thoth have done, your two brothers, who knew not how to weep for you! Set, this your brother is this one here, Osiris, who is made to endure and to live, that he may punish you! Thoth, this your brother is this one here, Osiris, who is made to endure and to live, that he may punish you!